Membership Committee’s charge is to consider, review, and recommend programs and services that will best serve the needs of the membership and support the Society’s overall mission. In 2016, the Committee welcomes four new members, Andrew Ewald of John Hopkins University, Iain Cheeseman of the Whitehead Institute of Biomedical Research, Erika Holzbaur of the University of Pennsylvania, and Sue Biggins from the Fred Hutchinson Cancer Research Center. ASCB strongly supports its graduate student and postdoc members, and this continual focus on their needs has translated into membership increases for these groups for the past several years. Additionally, the Committee and staff have worked to reengage Regular members who were no longer active in the Society. These efforts are partly responsible for a 3% total membership increase in 2015, the largest increase in total membership since 2008. One of the biggest challenges facing scientific societies is the increased competition for limited basic science research funding for their members. ASCB’s focus has been on looking for and sharing career development and funding opportunities for cell biologists at various stages of their careers. We are building awareness of and connecting members to all available career paths through the relationships and resources available to ASCB members. The Society continues to create opportunities for engagement and visibility to make all ASCB members feel that they benefit from being part the ASCB community. At the 2015 Annual Meeting we expanded speaking opportunities and visibility of attendees, with 30% of scientists who submitted abstracts for speaking opportunities being selected to give talks. Another goal is to continue to increase intellectual scientific engagement between senior scientists and younger members at the Annual Meeting and year-round through mentorship programs. ASCB facilitates communication among members with similar scientific interests throughout the year through our online membership directory. Keeping your profile up to date using the MyASCB portal (https://my.ascb.org/portal/#/login) will allow ASCB to help connect you with other members. The Membership Committee is very interested in understanding the needs of ASCB members. In 2015, ASCB conducted a survey of Regular members, and 28% of those surveyed responded. 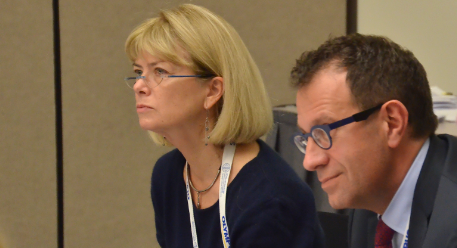 The ASCB Council meeting in December focused on ways to meet the needs expressed by Regular members in the survey. The Society will continue working on these plans in the coming year. In 2016, the Membership Committee will work closely with the Committee for Postdocs and Students (COMPASS) to roll out a survey for postdoc and graduate student members to assess the needs of these groups so that ASCB can best provide resources. We intend to continue to provide resources and highlight opportunities for young ASCB members as they progress through their careers.